During our recent trip to Italy the blue Mediterranean waters were calling us, so Hadley and I decided to rent a kayak so we could paddle along the cliffs of Sorrento. Looking at the inviting waters and the incredible scenery made us think there had to be some enterprising local who rented kayaks in this potential paddling Mecca. Our search to find a place to rent kayaks turned up only one choice. There was an old Italian man who rented all kinds of boats out of a very small, protected harbor underneath the cliffs of our hotel. When we looked down at the harbor we did not see any evidence that there were any kayaks to be found. When we got down to the beach we found a sign that mentioned kayak rental with all other kinds of rental. We had to go into a waterside restaurant to ask who rented kayaks. The waiter said just wait by the sign and he went off to make a call. Within five minutes this old guy rides up on his scooter with his Chihuahua riding on his lap. We quickly found out two things. He didn’t speak English and his dog knew more Italian than the two of us. However, we got past the language barrier and settled on a very old plastic double kayak. I still do not know what brand or model of kayak we paddled that day. We chose the double versus the questionable sit-on-top and a whitewater kayak. He told some young kid to wash out the kayak so we could use it. It appeared that it wasn’t used for quite some time. Then the young boy brought us two paddles. Then the old guy asked how long we were going to be out and I replied about two hours. Thank goodness for my high school Spanish. Before I could ask about spray skirts and PFD’s the guy was gone with the dog. I have to admit I really didn’t think we would get skirts and PFD’s once I saw the equipment. I don’t even believe they would even know about pumps or paddle floats. This is the time when all paddlers have to make a decision. How much risk am I willing to assume in order to go paddling? It was quite obvious that the “standard of safety” that I am accustomed to in most rental places in the United States didn’t exist here. My comment is not meant as a criticism because I believe the attitude about kayaking and being on the water is different from our values in the US. Liability concerns in Italy appear to be more lax than here in the U.S. I found the “do it at your own risk attitude” quite refreshing. Hadley and I checked out the conditions (warm water, relatively calm day and paddling close to shore), the equipment, our paddling plan and decided that the risk was minimal for our skill levels. I really have to question the reliability of our decision-making ability while on vacation. In other words we were determined to paddle during our Italian vacation unless a hurricane was coming in. I must also explain the condition of the two paddles we were given. The left hand controlled wood paddle with a 90-degree feather was really a right hand controlled paddle put back together incorrectly during one of its three breaks. Glue and duct tape held this paddle together. The second paddle was a two-piece adjustable. Needless to say I broke the paddle early during our paddle along the coast. Our brief kayaking adventure was great but that is not the purpose of this reflection. I am using our experience as a lead in to some thoughts and considerations about renting kayaks. Everyone has his or her own set of safety standards when it comes to minimal safety equipment need when kayaking. When we have the luxury of using our own equipment we are in our comfort zone. However, when one travels there should not be any expectations of worldwide safety standards for renting kayaks. Therefore, the question I asked earlier needs to be asked whenever you decide to venture onto the water and more so when you need to rent a kayak. The question is a simple one but the answer is not only complicated it is an individual one. 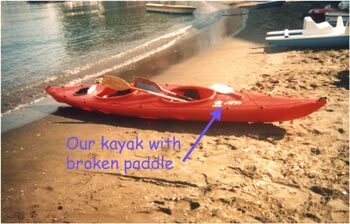 I am often asked what should be included when renting a kayak. My answer is based upon the liability standards in the United States including my opinion of reasonable equipment standards. There is a component that I will not discuss in this reflection and that is one of being properly trained to rent a kayak. After all, any true risk assessment needs to include ones skills, experience and judgment as part of the equation. Given you can handle the conditions what equipment would you ideally want to have with you? What equipment is reasonable to expect to get from someone who is renting kayaks? There are items that you will want with you and you may have to bring them with you if you know you will rent a kayak during a trip. If you cannot bring those items, you should be prepared to buy them at the rental location or do without. As our trip to Italy shows, there may not be any extras available for sale even if you wanted to purchase them. As you travel you will find that kayak rentals vary everywhere you go. If you are serious about paddling a certain location you should find out in advance what is available and what isn’t so you can supplement as needed in your own luggage. If you have the luxury of taking some equipment with you please read the USK reflections July 2006 "Borrowing/Renting Equipment." I have include a list of items I bring when I travel to do clinics and need to borrow/rent. This trip to Italy was only tourist luggage and very light since it was carried on our backs. As always, when you choose to paddle, you will be on the water using the equipment you have chosen to use in the conditions you ventured into. The consequences (good or bad) will be yours. When Hadley & I visited the area called Cinque Terra we stayed in the town of Vernazza. I was in pain because the kayak rental season had ended. The coast was incredible and all I could do was stand on the sea wall and cry because there were no kayaks available. I did find a few private kayaks in storage in an alley, but no one to lend them to me. I almost borrowed them (without permission), but alas, no paddles. The local rental agencies didn’t think the conditions were right for paddling. I believed they were ideal. I have included a just few of our 978 pictures to show you our Sorrento paddle, kayak with broken paddle and the coast I couldn’t paddle due to lack of rental equipment. If I were young again I would consider starting a touring business in either of these areas. 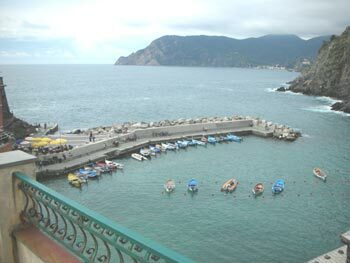 Here is a picture from the balconey of our host's house overlooking the Vernazza coast. If I only had a kayak.